With the assistance of occupational therapists and parents of special needs children we have designed affordable, easy to remove covers and caps for all of our Autism & Special Needs Furniture products. Children with autism and special needs often need further protection from spills and leaks, and with these covers you can protect your furniture for years to come. The Hug Chair can have a removable zippered cover in either microfiber or velvet fabrics. The Nesting Loveseat & Chair Sets instead feature an easy to remove fitted cap, which also has the option to be upgraded with a water-resistant liner in the seating area. Finally our Hug Beds & Crash Pads can have an additional zippered microfiber or velvet cover to go over the bed, which can also be upgraded with a water-resistant liner on one side. All of our removable covers are machine washable, durable, and resistant against even the worst spills and stains. Please note that in all cases, in order to get the water-resistant liner upgrade to any piece of furniture, a separate cap or cover must be ordered. The water-resistant upgrade is not available by itself. Cover systems can be ordered individually here as an accessory for your previously purchased Autism & Special Needs Furniture, or under the corresponding page with new orders. 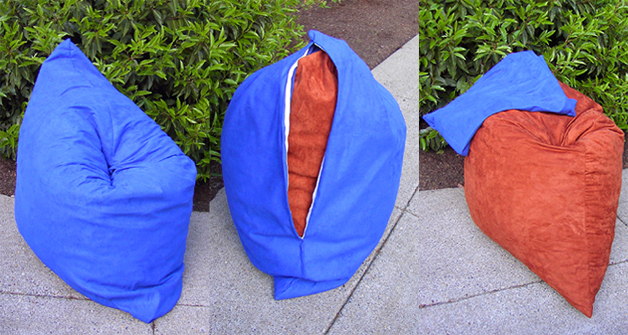 An example of a sky blue microfiber zippered removable cover on a copper microfiber hug chair.